NASSAU, The Bahamas -- Aaron Edgecombe has earned the coveted 2018 All-Bahamas Merit Scholarship Award. The prestigious award was bestowed on the Queen’s College graduate by Governor General Her Excellency Dame Marguerite Pindling and Minister of Education, the Hon. 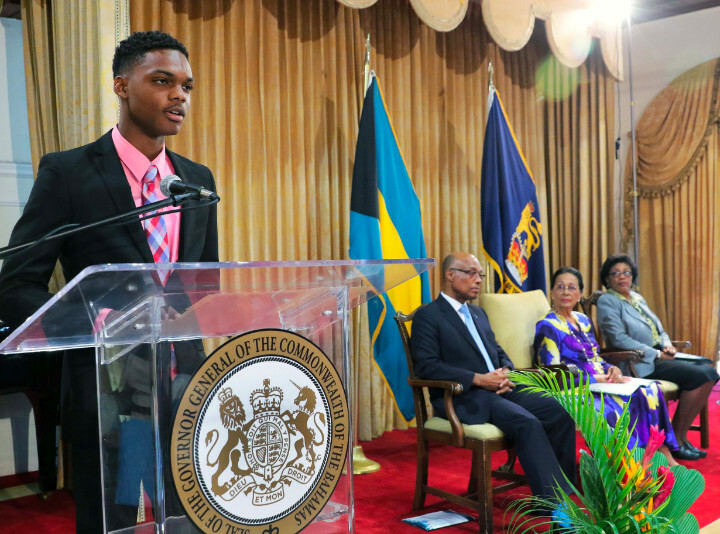 Jeffrey Lloyd, August 9, during the All-Bahamas Merit and National Merit Scholars Award Ceremony at Government House. 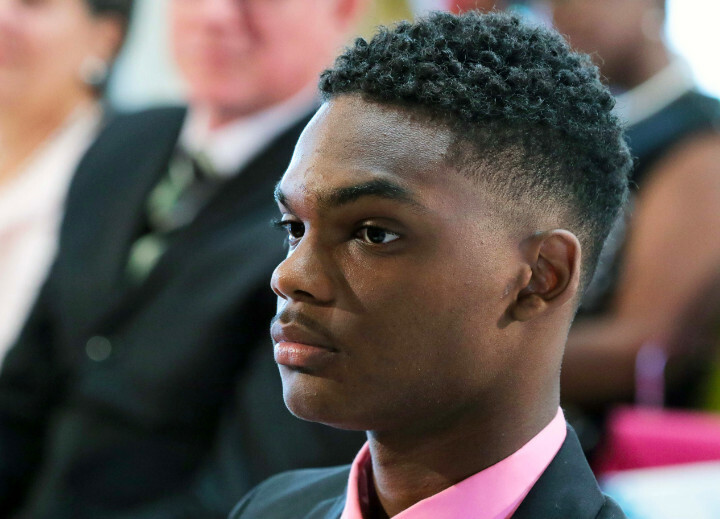 He is the 24th scholar to receive the title of All-Bahamas Merit Scholar since introduction of the award in 1993. An aspiring engineer, Edgecombe, plans to pursue studies toward a degree in Electrical Engineering at the University of Miami. His scholarship is valued at $140,000. Mr. Edgecombe was among the 2018 scholars whose high achievements, Minister Lloyd described as “unprecedented,” as he acknowledged their insight, brilliance and fortitude. Minister Lloyd also recognized Mr. Edgecombe’s parents, Adrian and Tiffany Edgecombe, to whom he requested the audience give a standing ovation. student Christian movement. He was also a cast member of the school production "Grease." He is an active member of his church, where he serves as Praise Team leader. He has been bronze and silver medal participant in the Governor General’s Youth Award, and member of the Spirit of Excellence Track and Field Club. Mr. Edgecombe graduated with a cumulative GPA of 3.95. In 2015, he was recognized by the Ministry of Education for having attained the best overall results in mathematics and health science at the BJC level, and in 2018 for his performance at the BGCSE level. In June 2017, he wrote twelve subjects at the BGCSE level and obtained 11 A's and 1 B. In his final year of high school, he pursued eight college level courses and achieved a 1460 score on his SAT's. In his remarks, Mr. Edgecombe thanked his family, teachers, school administrators, and church, Bahamas Harvest. “I am extremely honored to share this stage today with some of the best and brightest young minds in our country. We represent only a fraction of the great potential that our country has to offer. I strongly believe that some of the best resources in the country are not the natural resources of sun, sand and sea, but the human resources represented by you and me. He urged his peers to use the gifts endowed to them from God to leave the world in a better state than they met it. Derrica Ferguson, a graduate of St. Augustine’s College is the 2018 All-Bahamas Merit runner-up.